You’ll also see historical comparisons to see which way your pages are trending. And, like other stats in HootSuite, you can create a printable report to share with your colleagues, clients and executives. 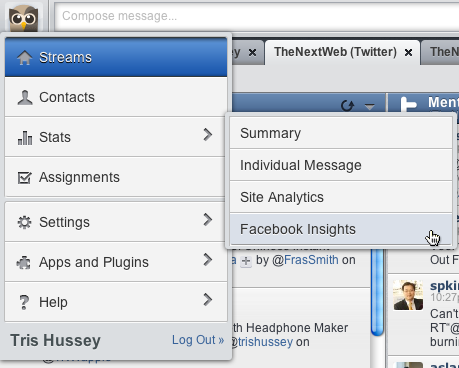 via HootSuite blog – Social Media Dashboard » Facebook Insights ~ HootSuite Adds New Ways to Analyze. All you have to do is add your Facebook Pages (not Groups) to your HootSuite account and then from the “Owl Menu” choose Stats -> Facebook Insights. Since this feature is so new, not many of us have had a chance to play with it, however I think it’s safe to say that the colorful charts and loads of data will be warmly received by social media wonks. One thing I figured out tonight while playing with Facebook Insights is that the Page admin has to add you as a user/team member within HootSuite to see a Pages data. For example I can post and manage on TNW Canada’s page, but I can’t see the data as yet. Regardless…great for HootSuite to have this add on. As for some other interesting bits in the post about HootSuite Pro, and HootSuite Enterprise. I think I need to see what little birdies tell me about those before I post here. @Zee are the hootsuite facebook insights the same as facebook gives u or have they added functionality? Thanks Dave…and yes, I’d agree, they are lovely.